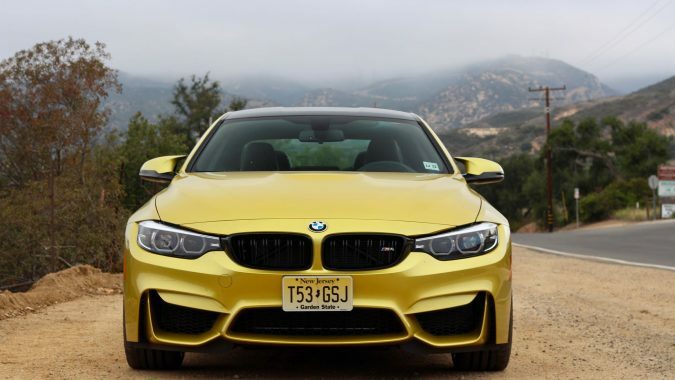 For the first installment of our series on road cars versus racecars, we’re having a look at the 2018 BMW M4 and one of BMW Motorsports’ latest competition cars, the M4 GT4. 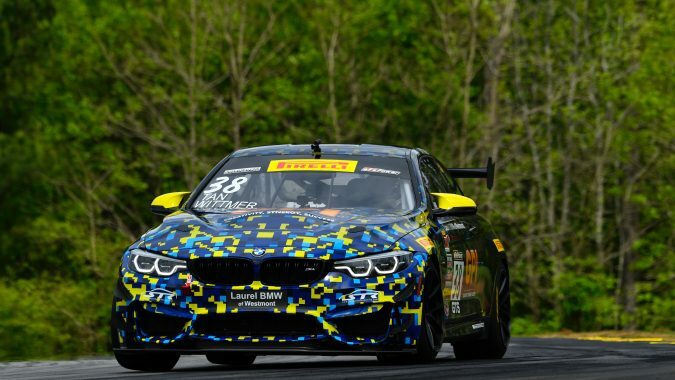 This may be one of the greatest times to be a racing driver because there has never been such an abundance of factory-built racecars available from numerous manufacturers. 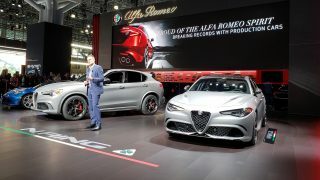 There are seemingly endless choices of offerings from your favourite brands and we began to wonder how much these racecars differ from their production-based counterparts – and how they drive. 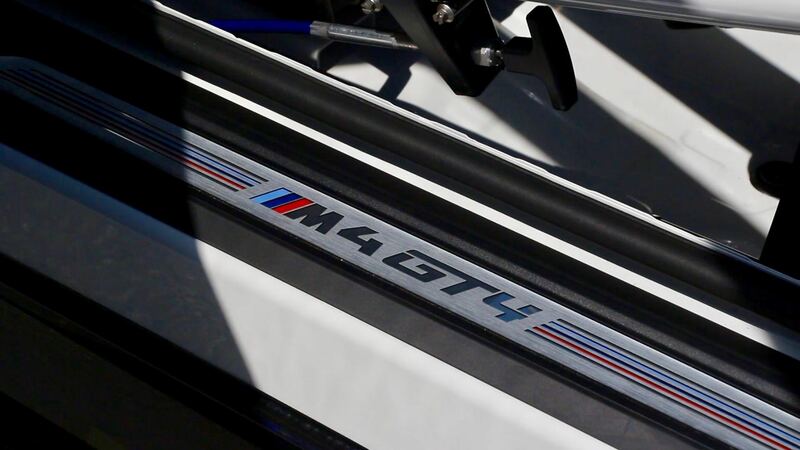 The GT4 name of the M4-based racecar isn’t contrived. 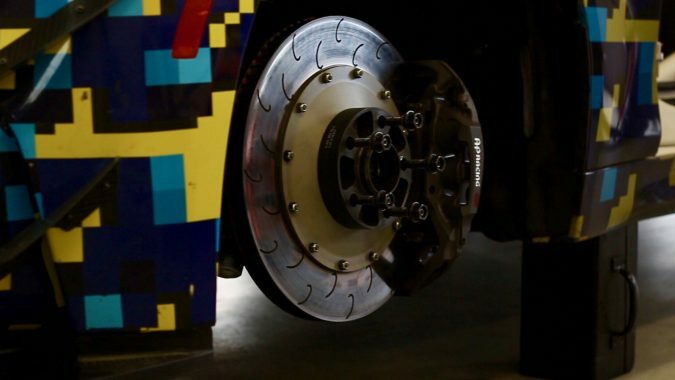 It’s a globally recognized, homologated category that’s being adopted quickly by teams across the globe. 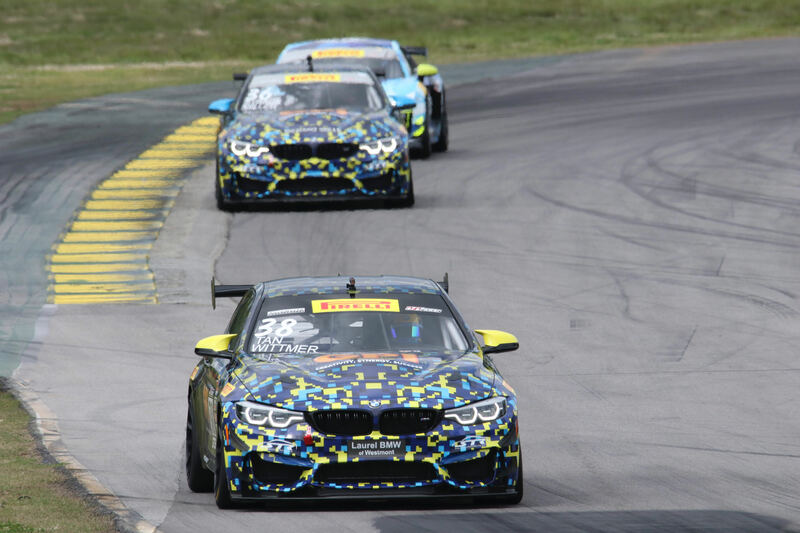 The performance of each car is balanced against the others and we’ll get into some other GT4 cars in this series. 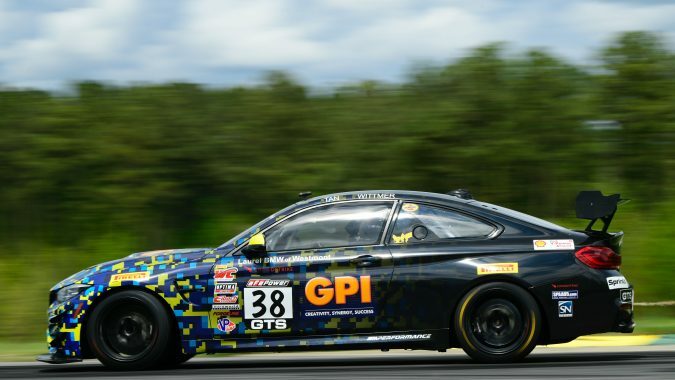 Think of GT4 as the pro level training ground for tomorrow’s sports car racing superstars. 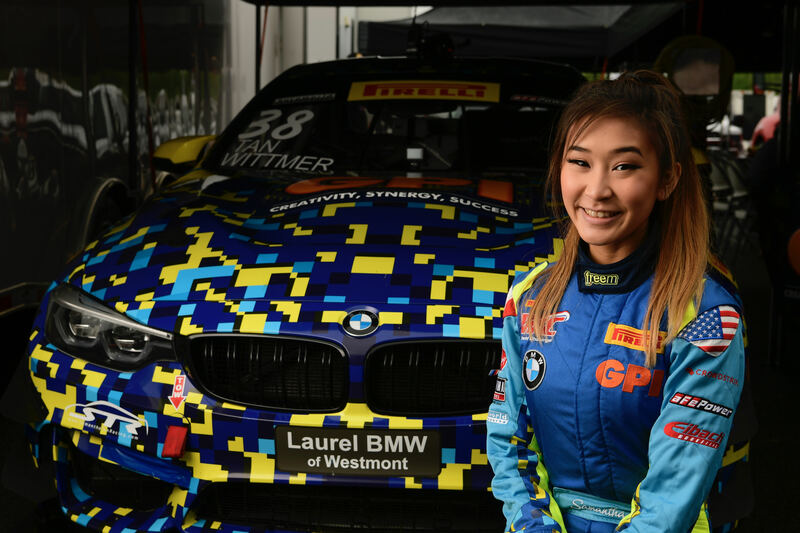 The Canadian-based ST Racing squad competes with this BMW M4 GT4 in Pirelli World Challenge, with 21-year-old Samantha Tan and her teammate Nick Wittmer sharing driver duties. 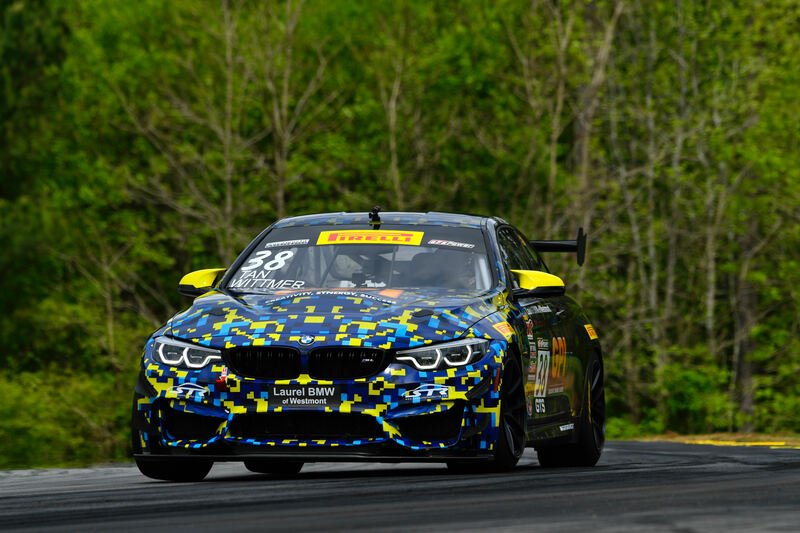 ST Racing invited me to join them while they were testing at fast and challenging Virginia International Raceway. 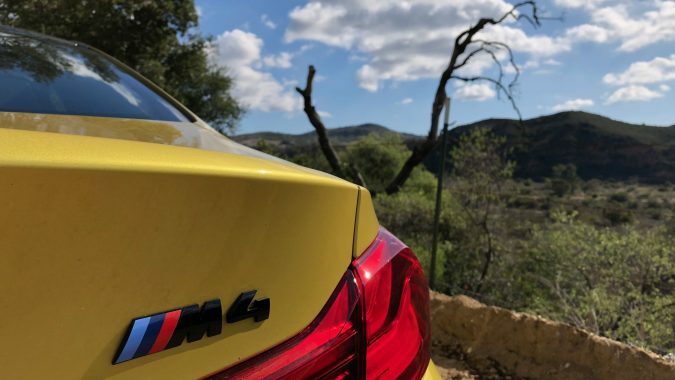 To get a baseline for the racecar, I’m also testing the M4 road car which has been treated to a light refresh for 2018. 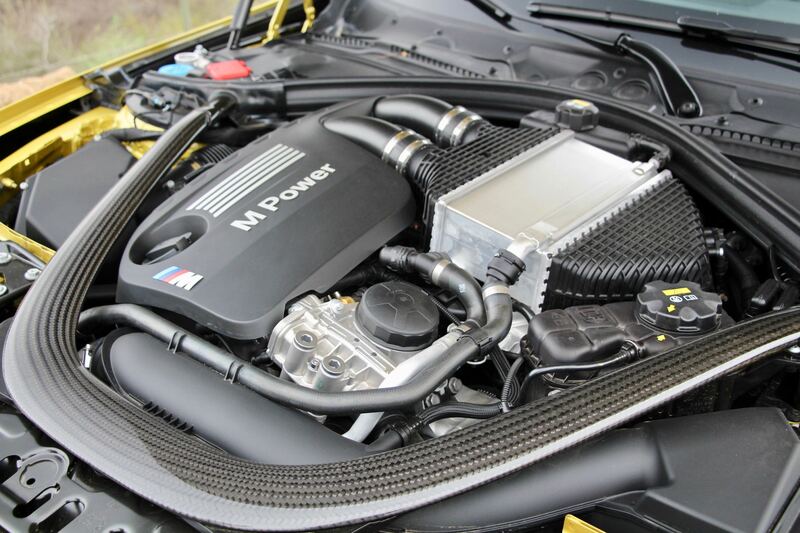 BMW’s legendary two door M-car uses the tried and true S55 twin turbo, 3-litre in-line six and with the Competition Package, output is 444 horsepower and 406 pounds of torque. 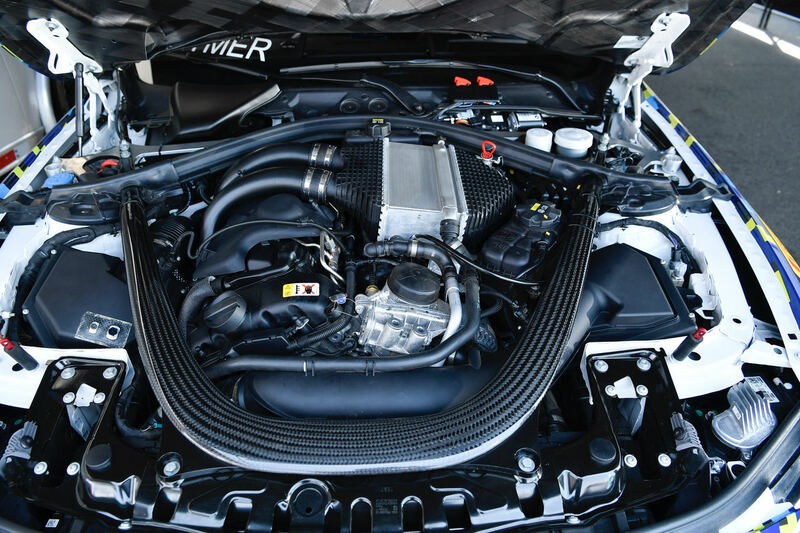 Peak torque is one massive plateau – from 1,850 to 5,500 RPM which makes this motor as flexible as a gymnast. 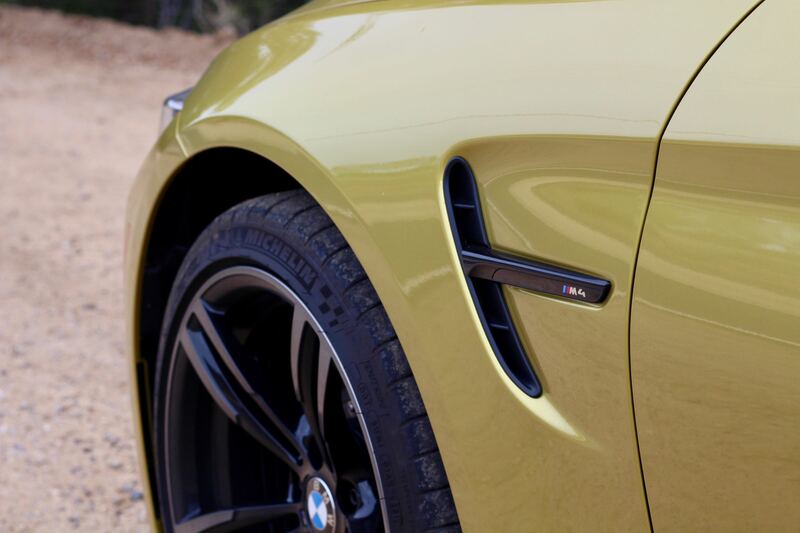 Torque is always immediately available and it’s no surprise the M4 will do zero to 100 km/h in the low fours. 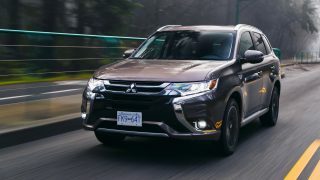 With the seven-speed dual clutch transmission and the electronically controlled limited slip differential, power delivery is seamless and power gets to the ground like butter melting through hot toast. 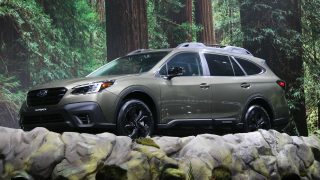 The benefit of the dual clutch is that the engine never seems to be off boost and if there’s any lag, it’s imperceptible. 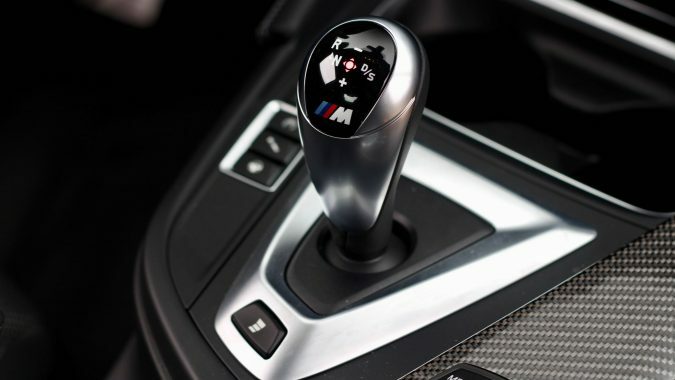 The M4’s shifter is unconventional with drive (and toggling between auto and manual modes) to the right and reverse to the left and up, but after a few times it’s perfectly intuitive. 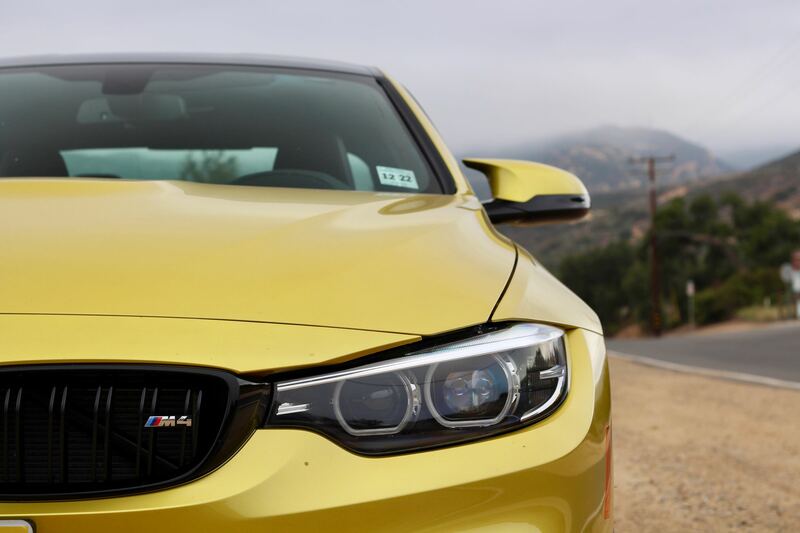 It’s an authentic touch of differentiation because the way it works is different from every other car on the road. 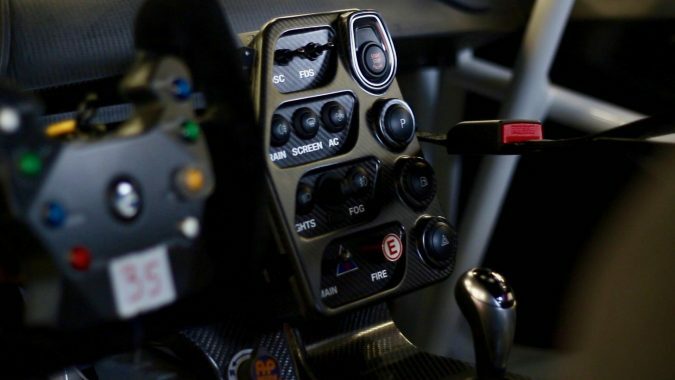 Shift paddles are on the wheel, not the column, and work flawlessly. 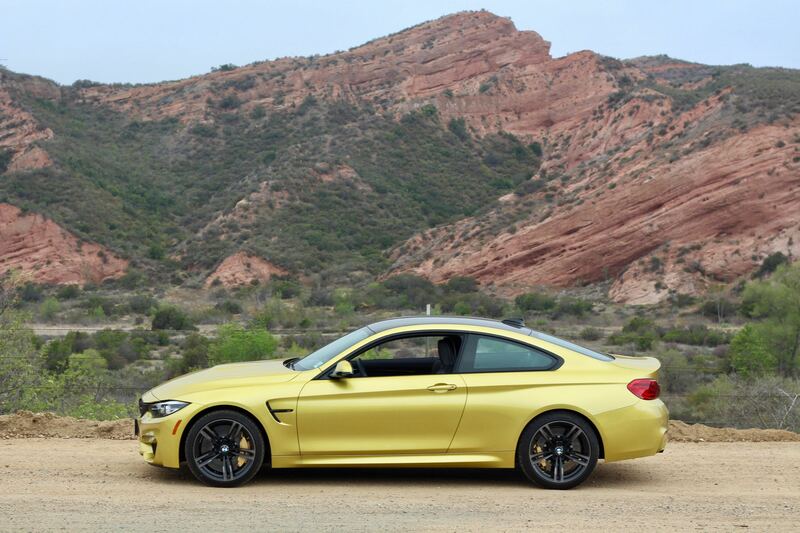 BMW knows how to do seats and they’ve got it right with the M4, particularly with the specification of this test car. They’re basic power seats, with cloth inserts (unfortunately unavailable in Canada) and interesting voids in the seatback. There’s plenty of adjustment in the steering column, as well. 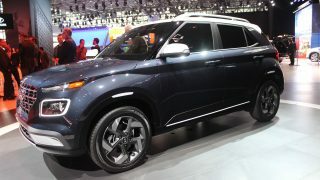 There’s not much to say beyond that the seats, seating position, and visibility are faultless. 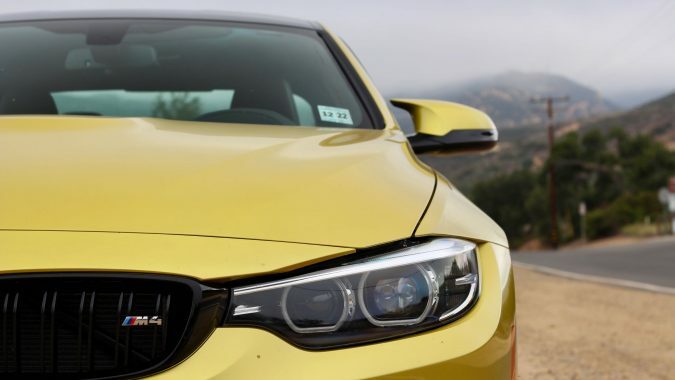 Building drivers cars is clearly in BMW’s DNA. 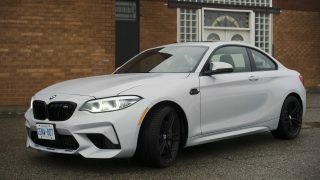 In this road car, there are different levels of steering assist, from light to firm, and the steering has some heft to it, even in the lightest setting, which is what I prefer, because there’s no difference in road feel between any of the settings. 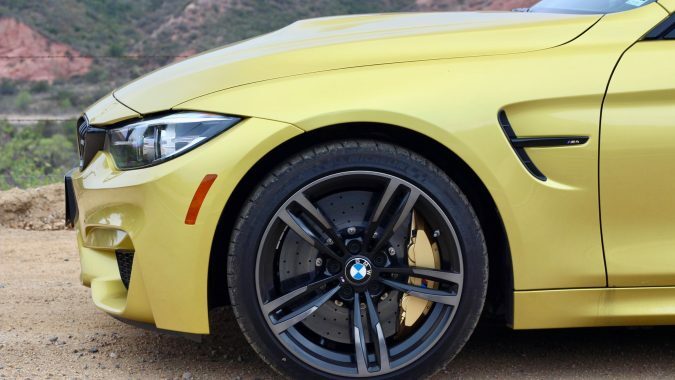 The Competition Package option includes stiffer suspension settings than the base M4 as well as adaptive dampers, and I think the calibrations are perfect. 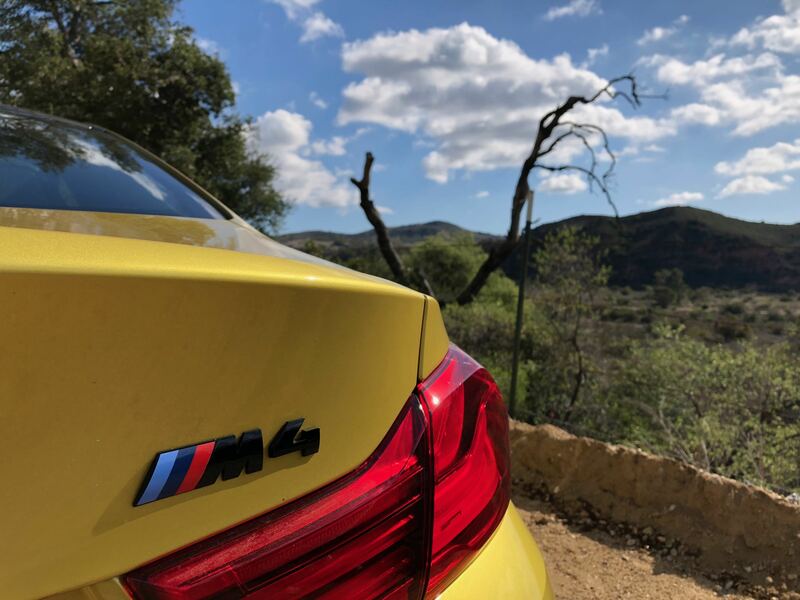 I’m driving this M car in all sorts of conditions from dirty downtown streets to mountain roads and it strikes the ideal balance between comfort and handling. 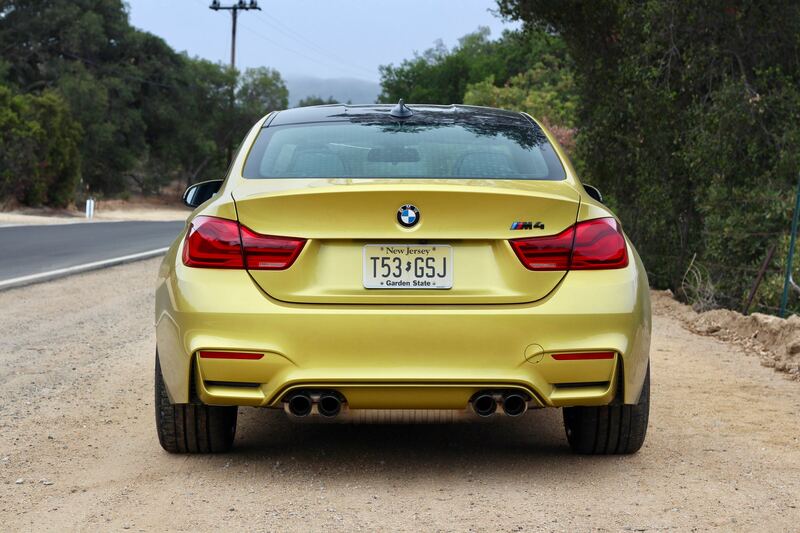 If I’m going to complain about anything in this M4 road car, it’s the overboosted brake pedal. 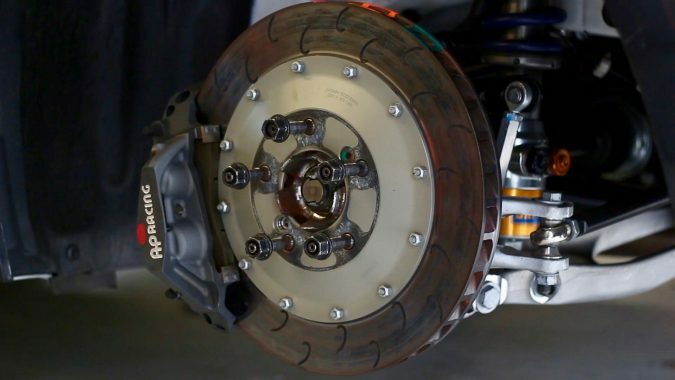 The brakes have great power and when you’re hustling and are really getting into the pedal, modulation and feel are excellent, but the pedal gives the brakes too much initial grab. 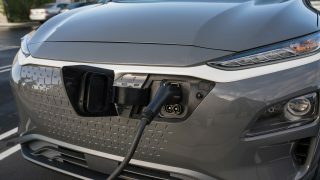 It’s a small annoyance in an otherwise excellent car. 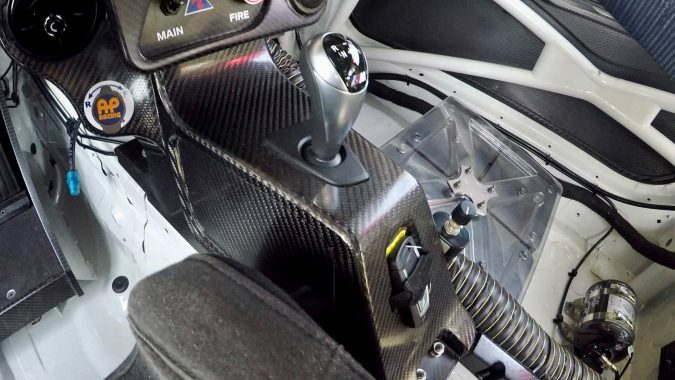 Building a raccear is very different than building a volume road car. 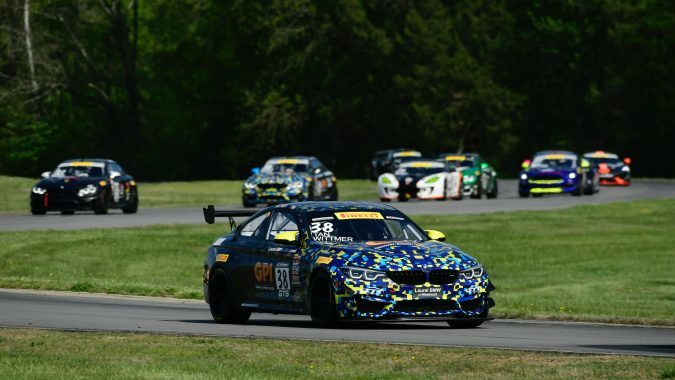 Plus, you can go about making a GT4 racer in plenty of ways, but with years of experience BMW actually knows how to build competitive customer racecars. 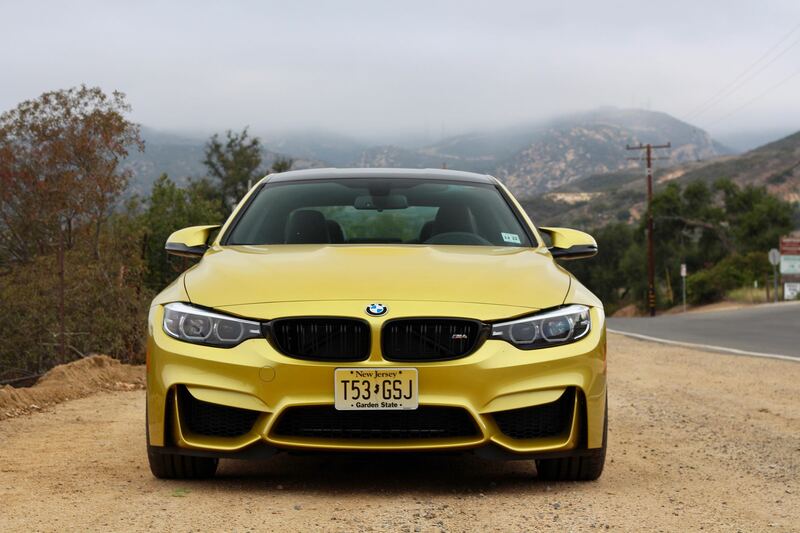 They’ve clearly succeeded here, but they’ve also taken the time to address the small details – the things that give this M4 racer an abundance of cool. 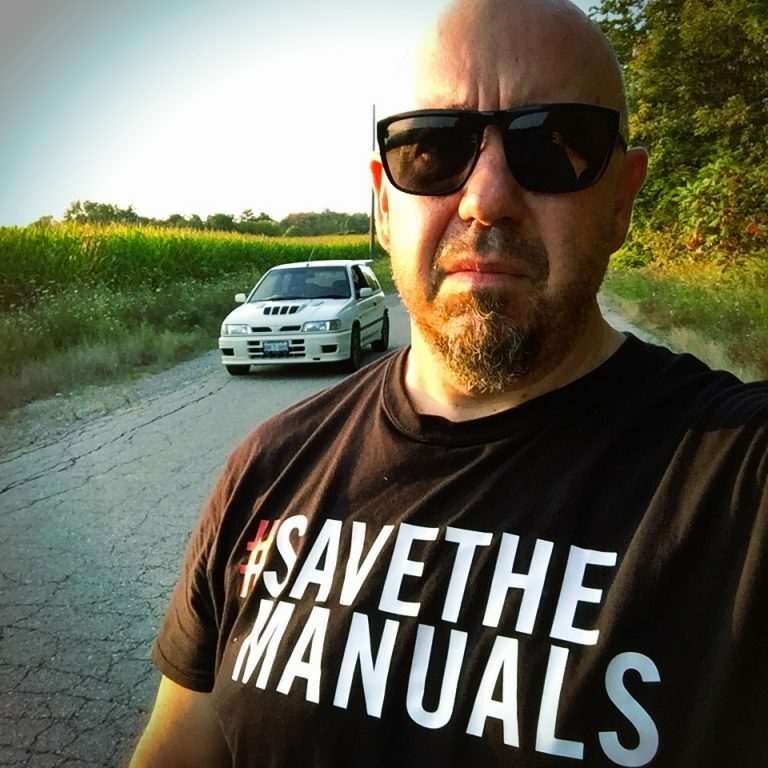 What’s important to know is, save for the roll cage and minor motorsport-specific modifications, the race and road bodyshells are identical. 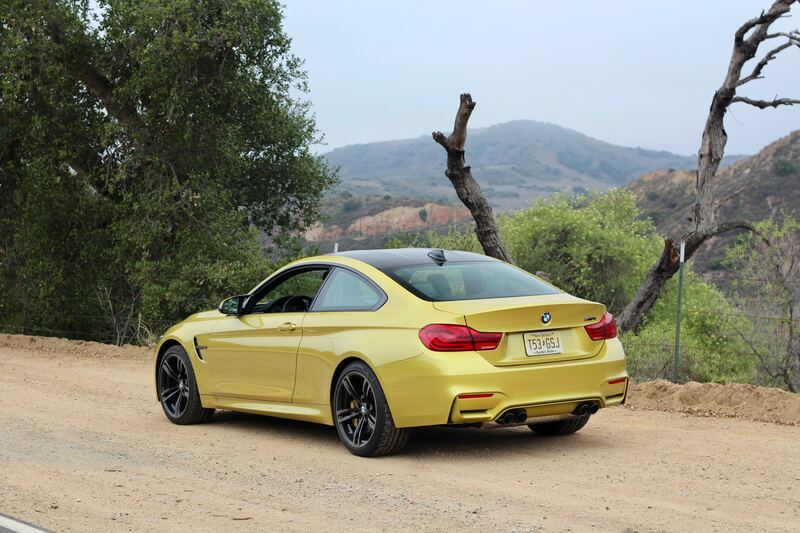 Mechanically, the GT4 is as close to the roadgoing M4 as possible. 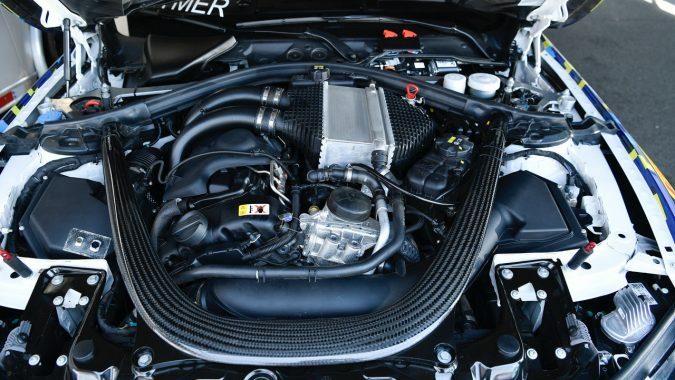 Just like the road car, the drivetrain starts with the S55 turbocharged 3-litre six-cylinder engine and the seven-speed dual clutch transmission, but it’s got a mechanical limited slip diff, unlike the road car’s e-diff. 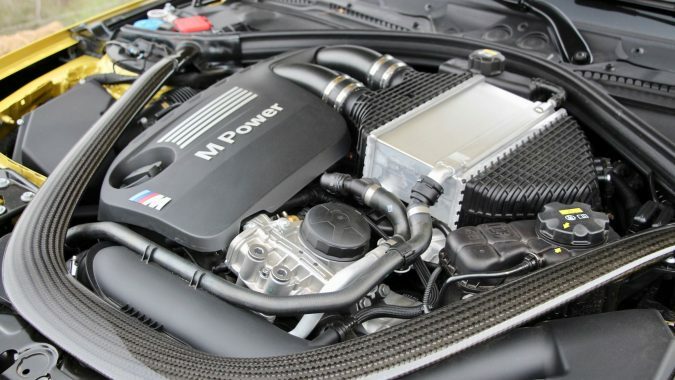 Engine output of this M4 GT4 is governed by five power sticks that offer various levels of output – which BMW doesn’t actually disclose to GT4 owners, except to say output is “more than 431 horsepower” – and at the time of this story, to balance the M4 GT4’s competitive performance, the Pirelli World Challenge cars are running on the silver and IMSA Continental Sports Car Challenge cars are using the red stick. 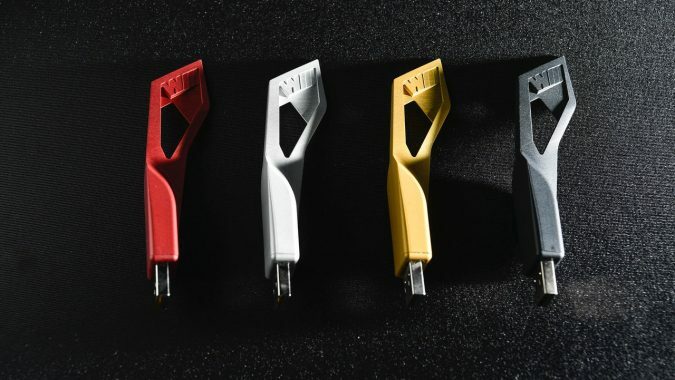 These cool, M-branded, and colour-coded power sticks are placed right at the top of the dash for everyone to see. 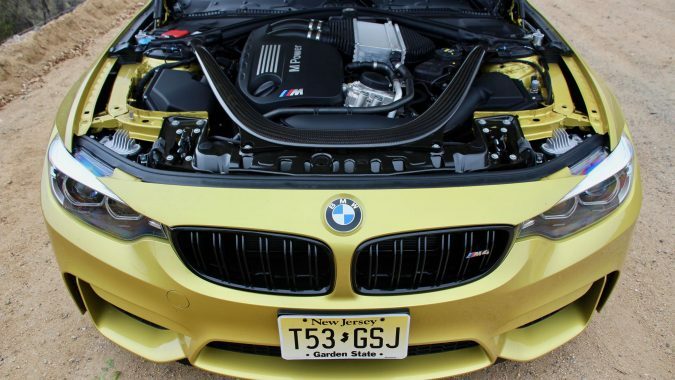 James Clay, BMW M4 GT4 racing driver and owner of US-based BMW tuning shop Bimmerworld, tells me that while red is the lowest output power stick, the silver is not noticeably different. 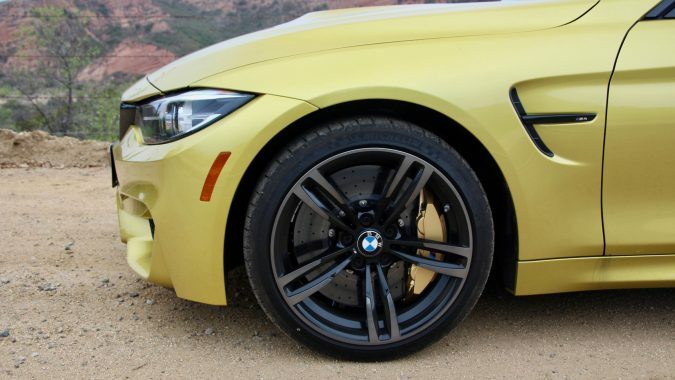 Clay also says the power and torque curves of the highest output black power stick resemble that of the special edition 500-hp M4 GTS. Underneath, there are ball jointed suspension links, coil over adjustable Öhlins dampers, and a couple of other things that aren’t apparent to the eye. 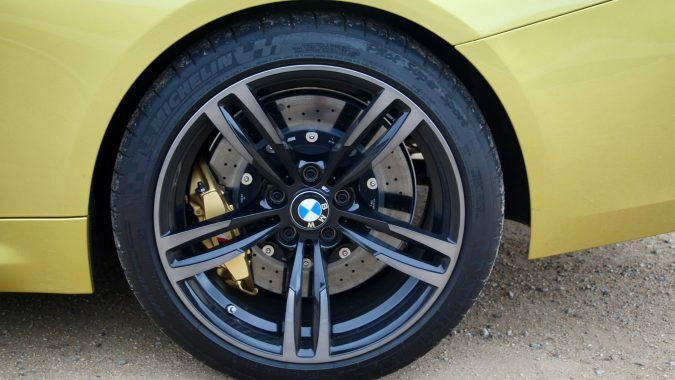 For example, Clay says that some road car customers have come to him asking him to fit the race car’s 11-inch wide front wheels, but guess what? They don’t fit. 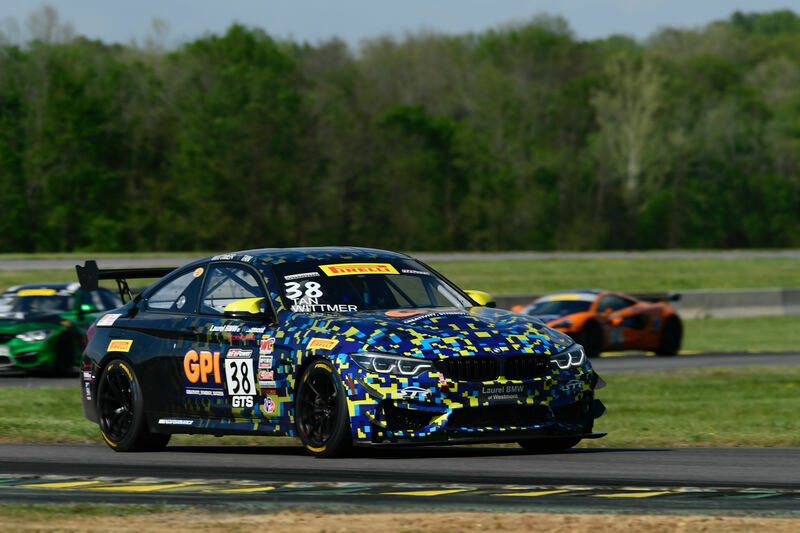 Clay says that in fact the front track of the GT4 is actually narrower than the road car so that the 11-inch wide wheels fit under the stock fenders. 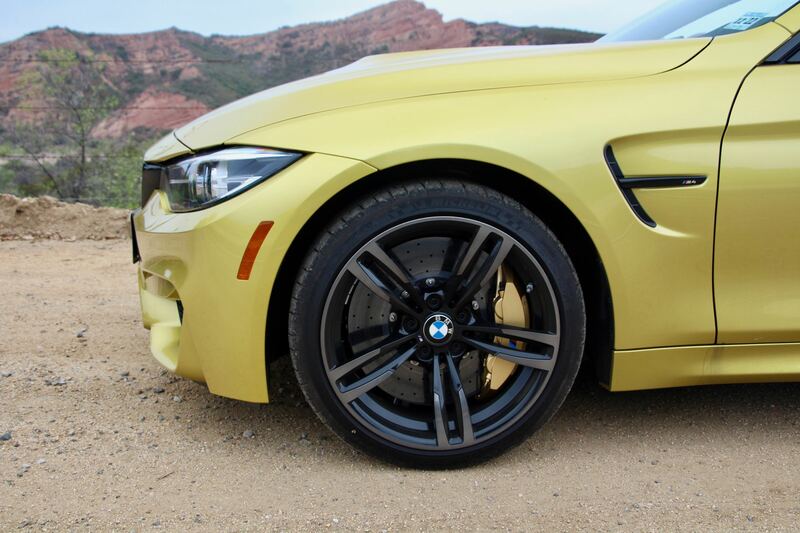 Brakes are by AP, and there are massive two-piece steel rotors all around, unlike the M4 test car’s carbon ceramics. 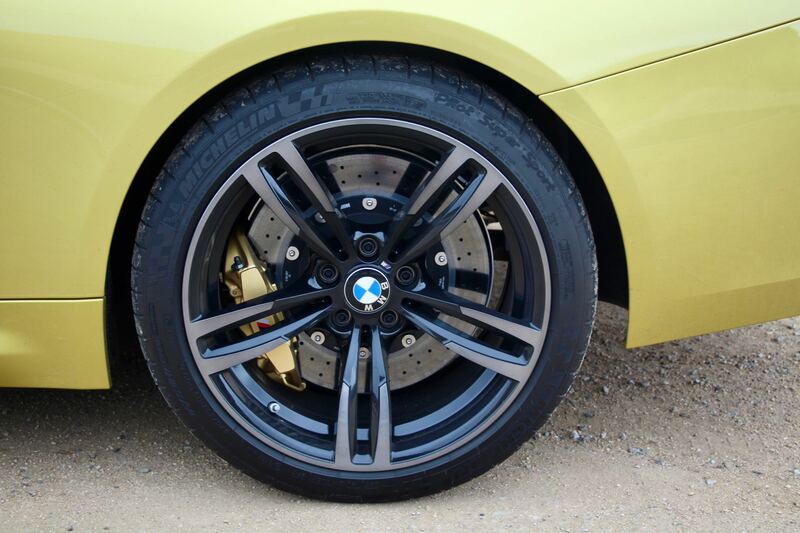 ABS and stability control systems use motorsport calibrations specific to the GT4. 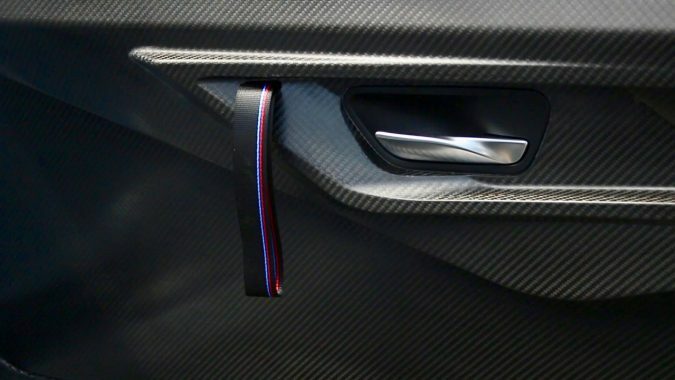 As well, BMW Motorsport removes plenty of core electronic bits of the road car and uses a unique wiring harness, so many of the road car systems that used to talk to one another can no longer do so. 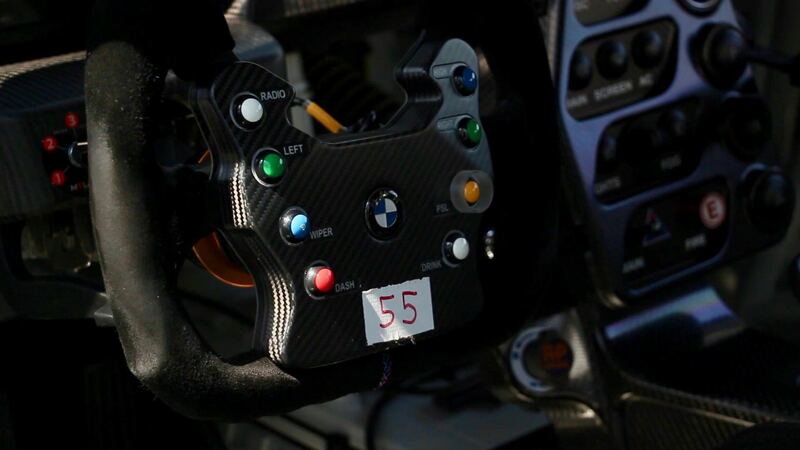 This would otherwise result in countless issues and ultimately a racecar that won’t even start, so BMW Motorsport’s developed a solution. 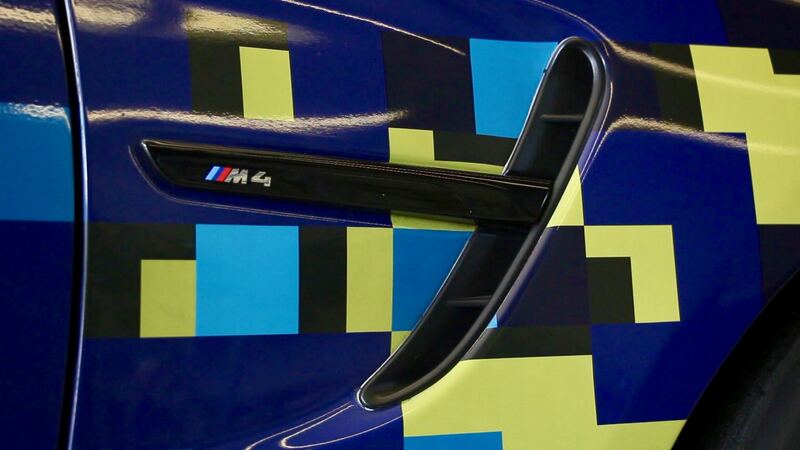 On the outside, the main differences are the front splitter, dive planes, and tall rear wing, which have been validated by BMW Motorsport in the wind tunnel, and with the GT4, the hood and roof are made of carbon – and so are the doors, which still retain the power mirror function. Windows are fixed in these doors and BMW does some on-brand, striped door pulls for them. The doorsills are branded with the M4 GT4 designation and the cool factor nearly overwhelms me. 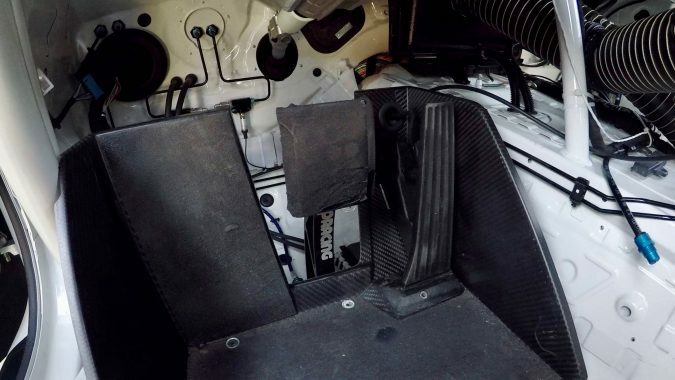 Like any good race car constructor, BMW Motorsport optimizes weight distribution and driver safety, so they put the seat lower and much further back in the chassis – so low and so far back that the driver sits on the floor where the rear seat floor mat would reside. The steering column is much longer to suit, has some adjustment, plus the wheel is detachable, of course. 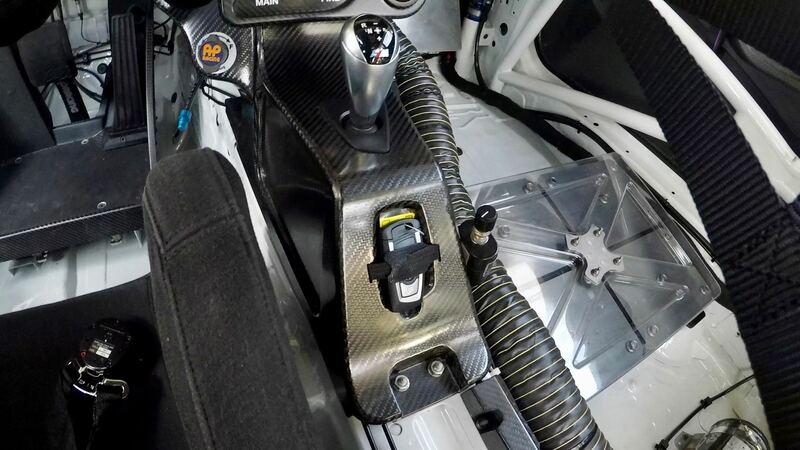 The pedal box is set further back to match that rearward seating position, with a brake pedal from AP and a very BMW-looking throttle pedal. Now here’s more of that cool factor. 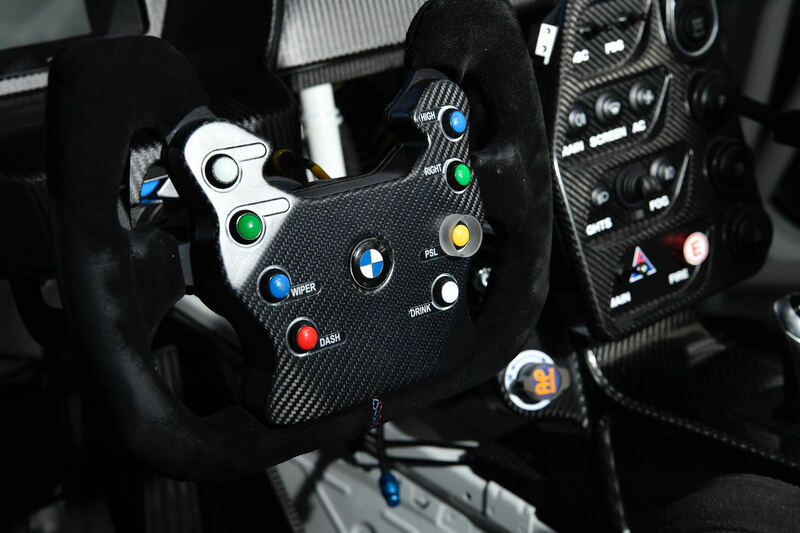 BMW’s familiar start button carries over to the race car and since this GT4 is indeed derived from the road car, the car’s key – yes, it has a regular BMW fob – must be placed in the car for it to start and run, so it’s got a special velcroed spot at the back of the gorgeous carbon fibre console. 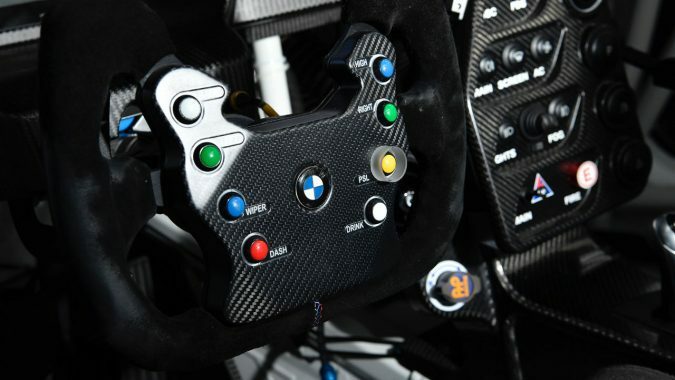 The steering wheel is pure racecar and it looks like something out of a Formula 1 car, although a little less complex. 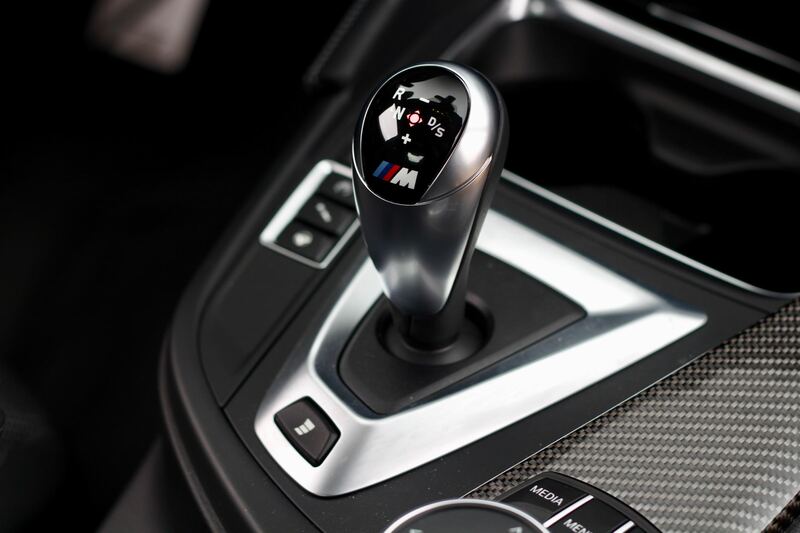 The two grips keep your hands in the right places and the shift paddles are straight out of the M4 road car. 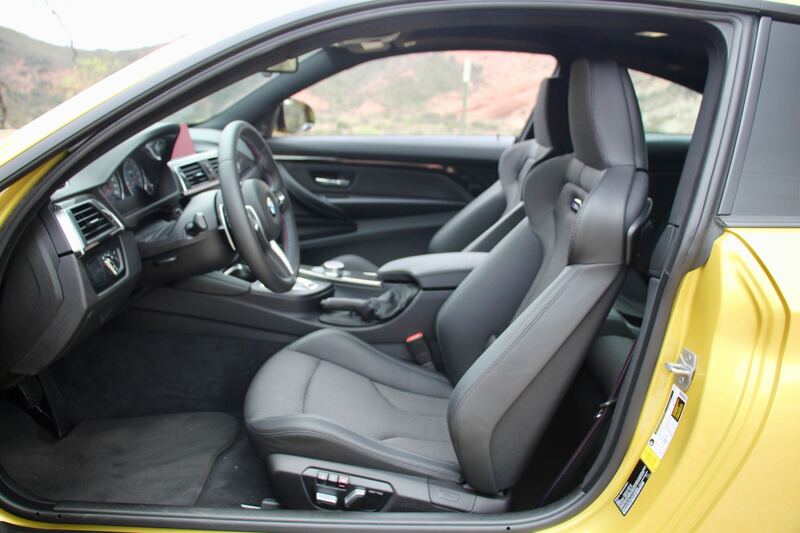 The deep racing seat is designed for support and safety, and you’ve got a six-point harness holding you in place. 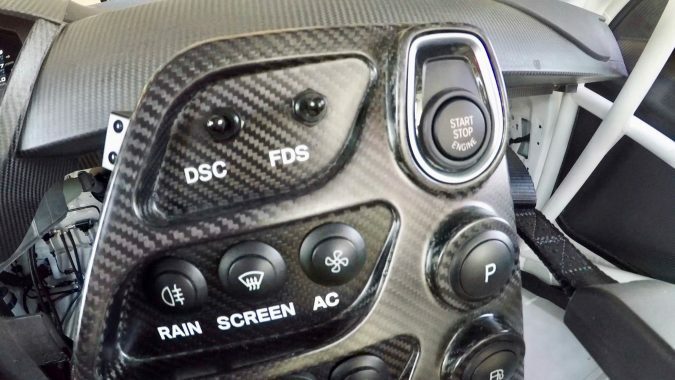 Available to the driver are the necessary motorsports pieces like a fire suppression system, master electrical cut off switch, an AP-supplied brake bias adjuster, but one of the coolest things is the race-spec dash. 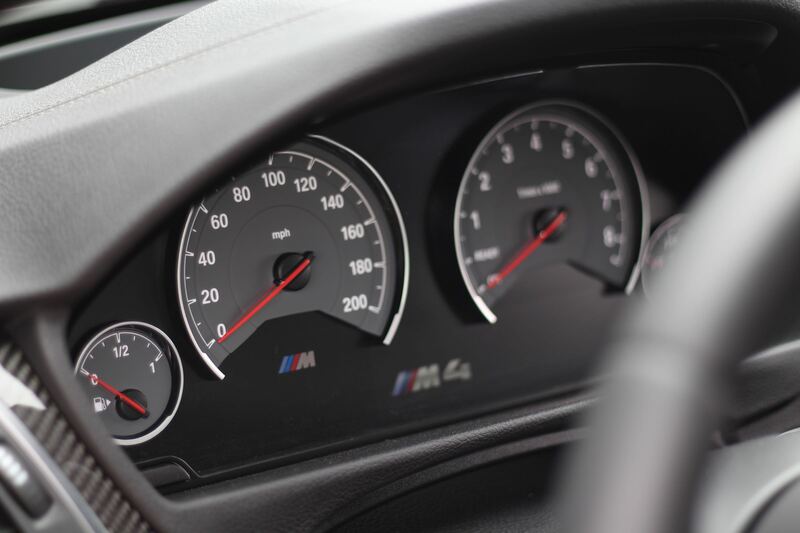 It’s highly visible screen displays more information than you’ll ever need as a driver. 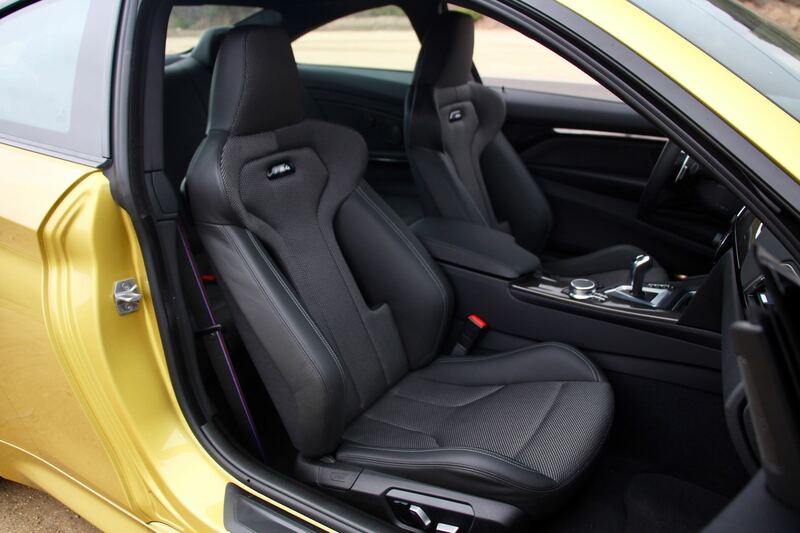 Speaking of cool, the GT4 also has air conditioning. 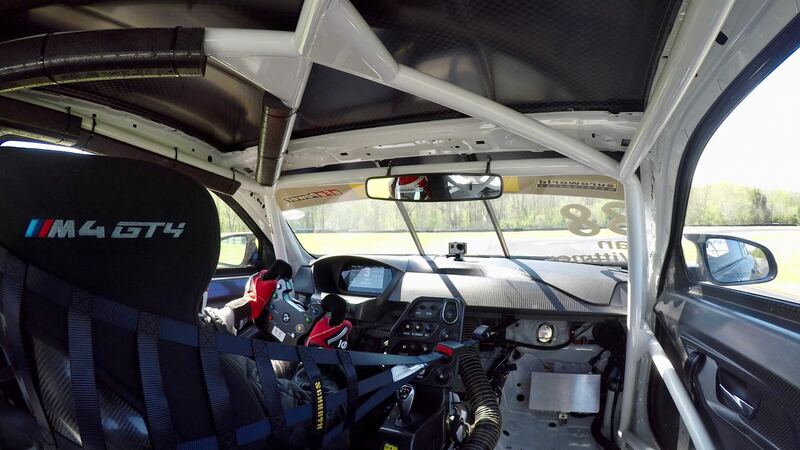 Yes, air conditioning in a racing car. One duct faces the driver and another one sends cooled air into the seatback. 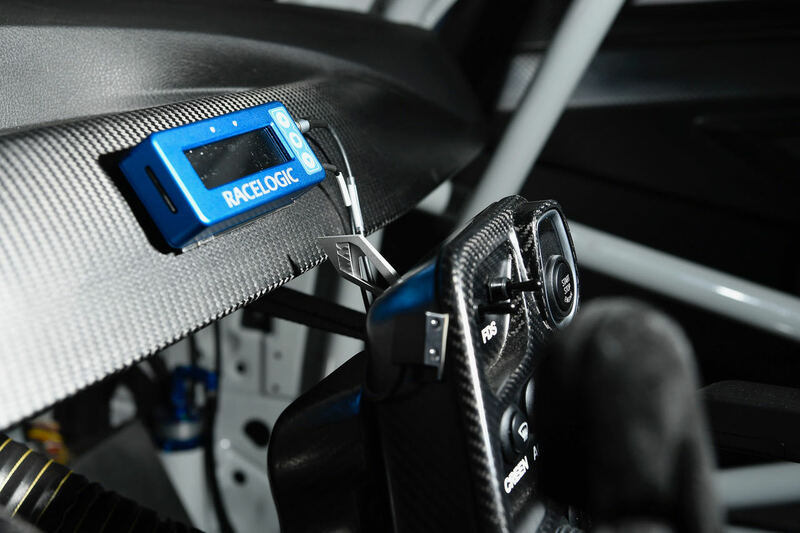 Not that noise matters much in a racecar, but the settings are either maximum fan or off. 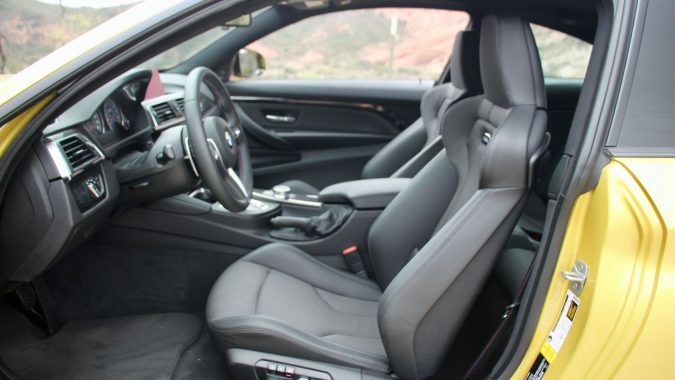 Behind the wheel, the first thing I notice is that seating position is compromised simply because you sit so low and so far back in the chassis. 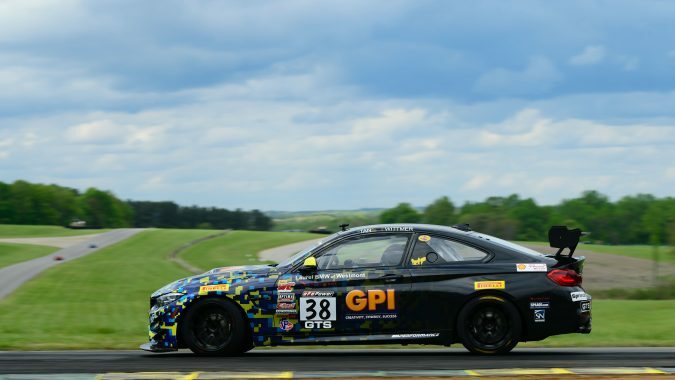 You really can’t see much out of this GT4 in any direction, which is the case with most racecars. 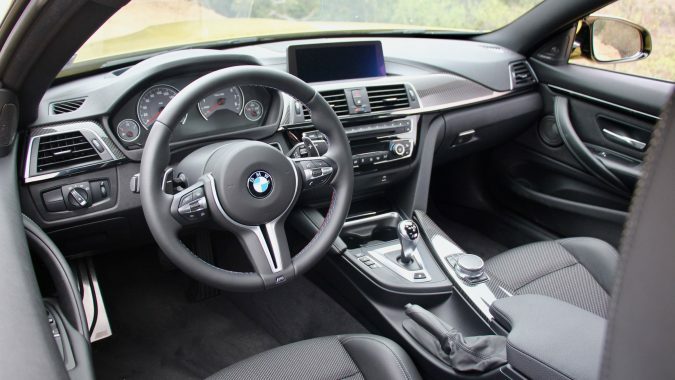 The steering wheel is perfectly placed and all business, but it’s ridiculously cool. 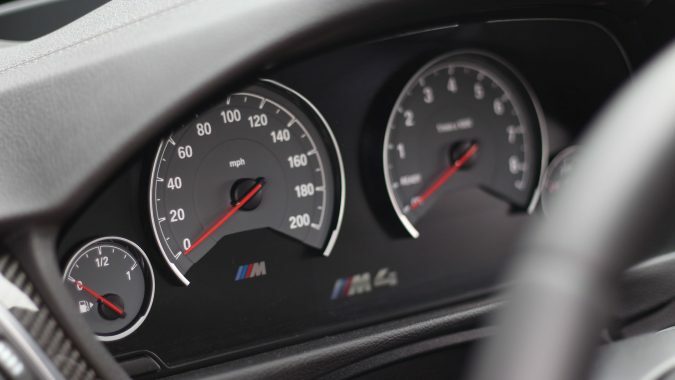 Once I get started, I’m pleased because I find that the throttle is very BMW and it’s pretty linear, but by corner one – and even though Samantha warned me – the huge amount of pedal pressure required to get the brakes working is astonishing. If the road car brake pedal takes, I’m guessing, perhaps twenty pounds of pressure, the GT4’s pedal takes easily ten times that. 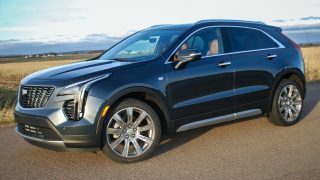 Sam’s right, it is leg day driving this thing. 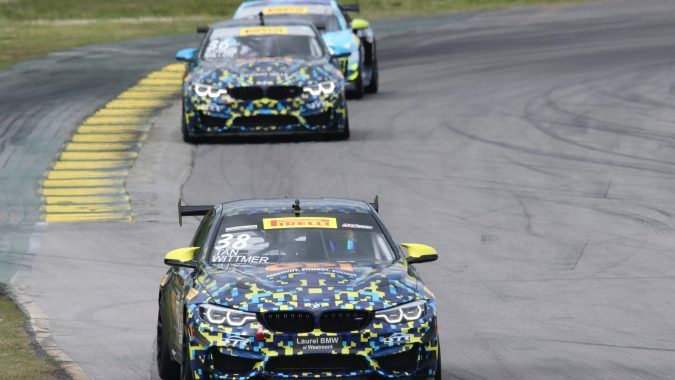 As I dial some steering into VIR’s turn one-two-three combination, I notice that steering effort is remarkably light. 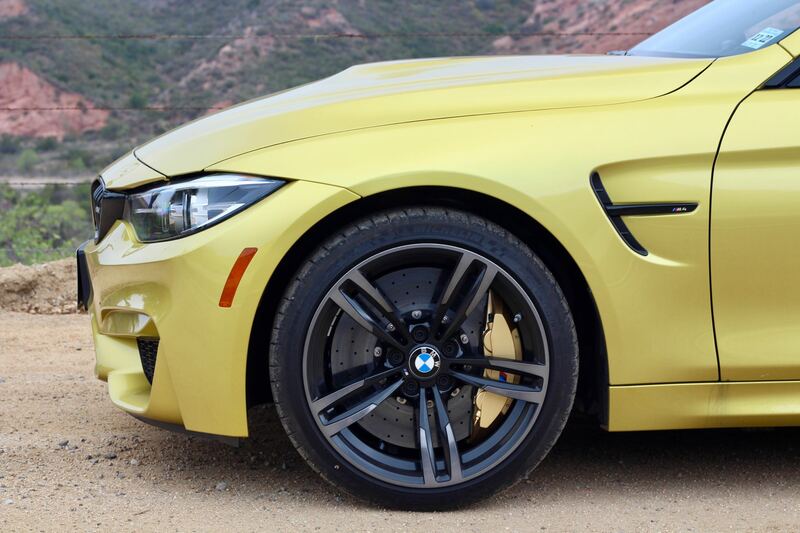 It’s much lighter than the road car and there’s just the smallest amount of feedback from the wheel. 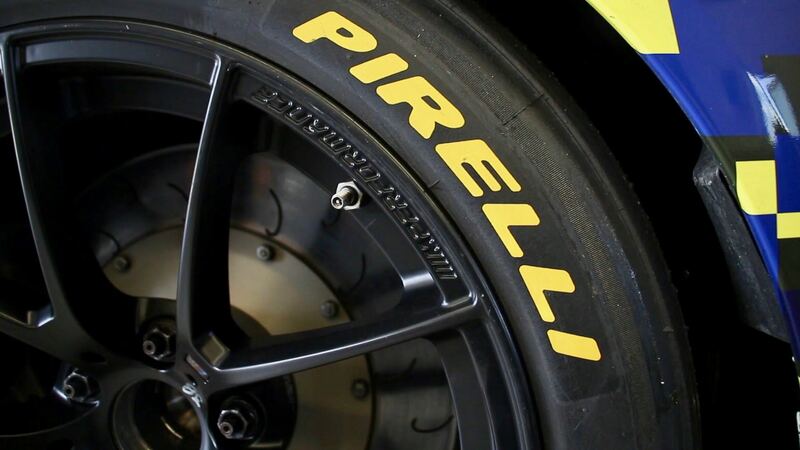 I’ll let you in on a little secret: racing drivers generally don’t car about steering feel. 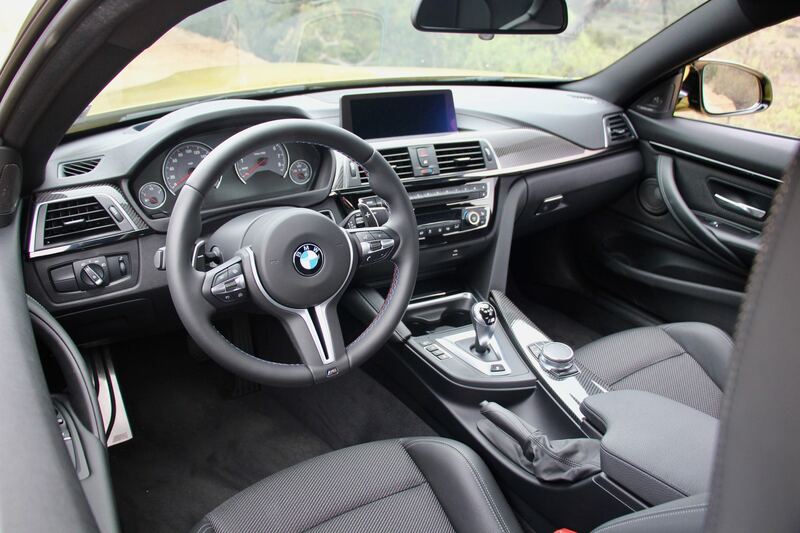 As long as the steering is responsive and linear, feel is entirely secondary. 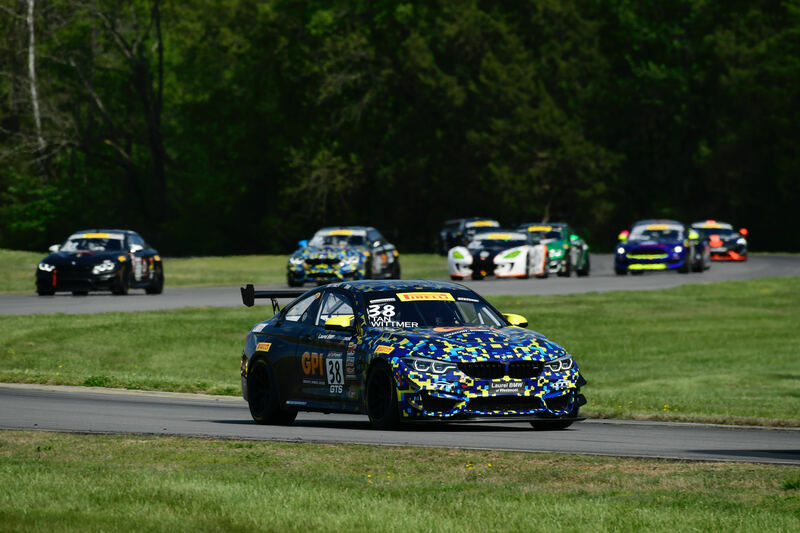 Within a few laps, I’m feeling easily comfortable and the car is giving me high quality feedback. 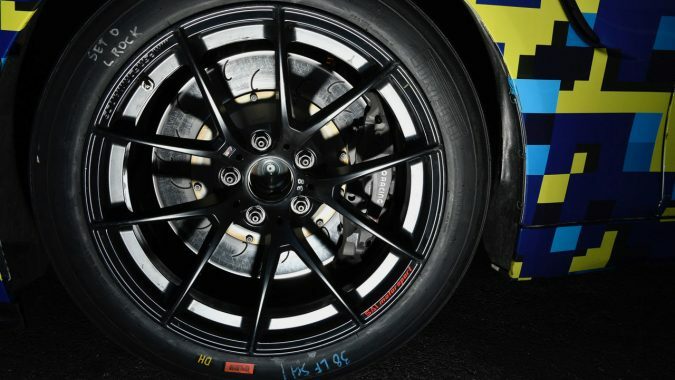 I try a couple of things, the sorts of techniques I use racing my front drivers, to test mid-corner traction, and the GT4 instantly tells me those are the wrong things to do and to get back to the business of driving this pro-level rear driver properly. 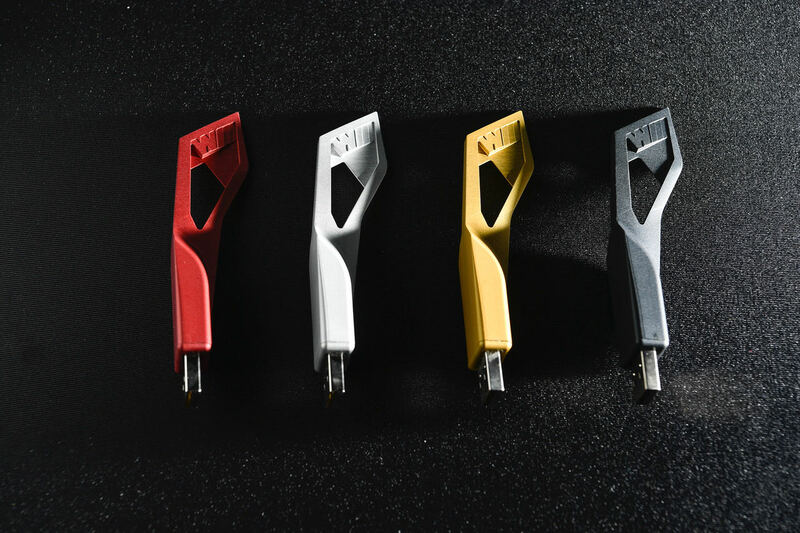 Feedback is simply instantaneous and unmistakable. 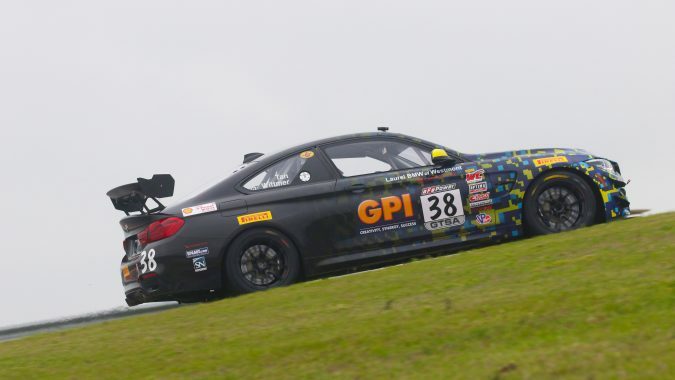 After a red flag-shortened first session, I take Samantha’s GT4 out for another run around VIR and it’s even easier to drive than my first run. 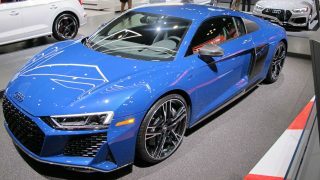 The steering is scalpel precise and once I get used to the braking effort, my confidence climbs on each lap. The Pirelli racing slicks have a massive amount of grip compared to the road car’s tires and, especially going up VIR’s famous esses, the aero grip is apparent and the faster I go up those esses, it seems the more grip that I have. 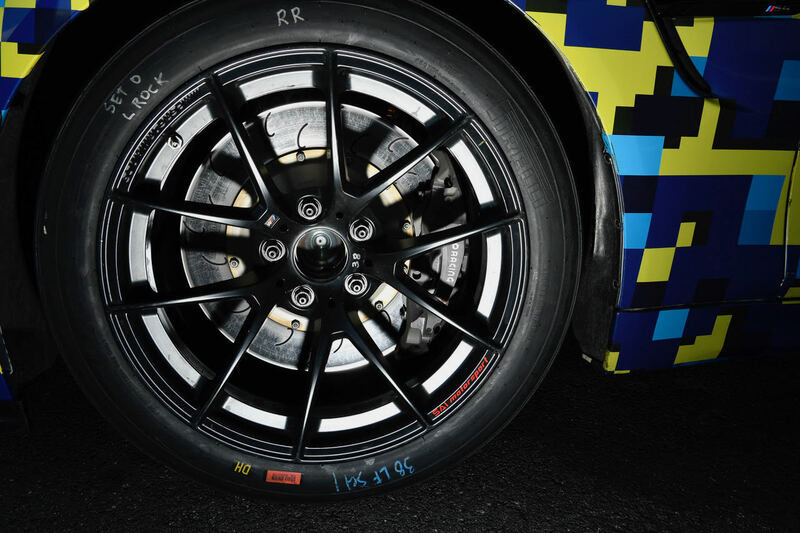 It’s fast and exciting and thrilling and frightening all at the same time, but the GT4 never puts a wheel wrong. 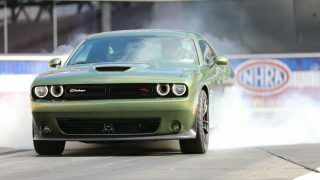 The dash display includes lap times and as I get more comfortable with the GT4, my times are coming down lap over lap. 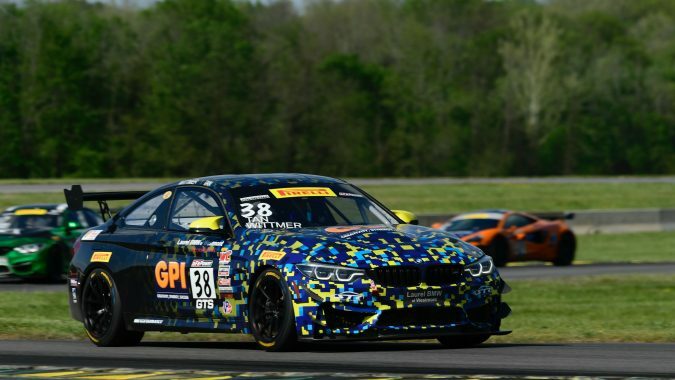 In the end, my fastest lap in this GT4 is faster than when I raced a Viper ACR-X here at VIR a few years ago and it’s simply shocking how quick the BMW is around this circuit. 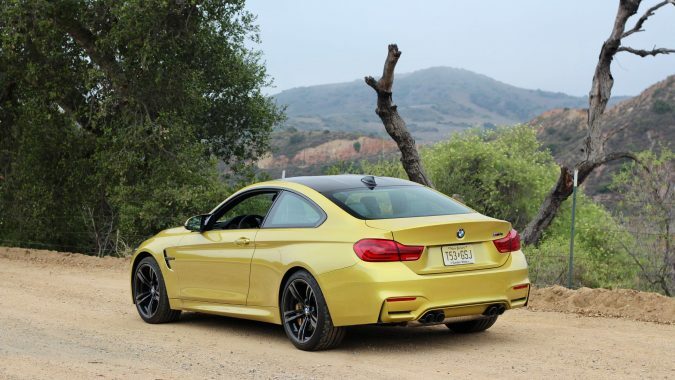 My ability to get up to speed so quickly speaks to the GT4’s approachability. 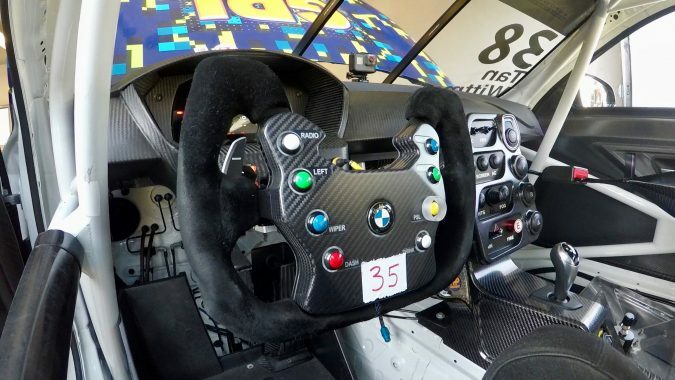 With that light steering and air conditioning, it’s the kind of racecar that doesn’t beat you up and reduces the physical demands on the driver so they can get on with the business of going fast. 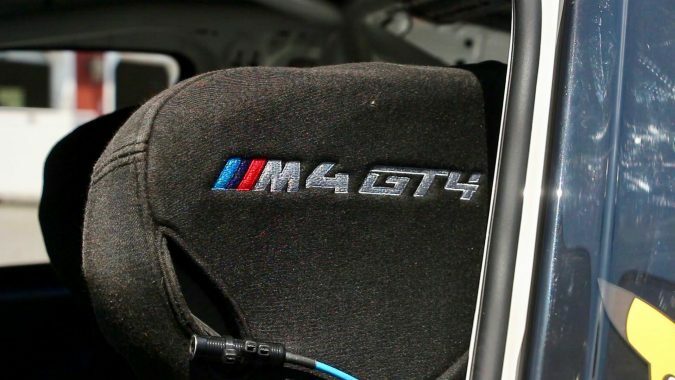 That’s very clever on BMW’s part because drivers will appreciate it and I think the lesser physical demands are also part of the GT4 category’s appeal. 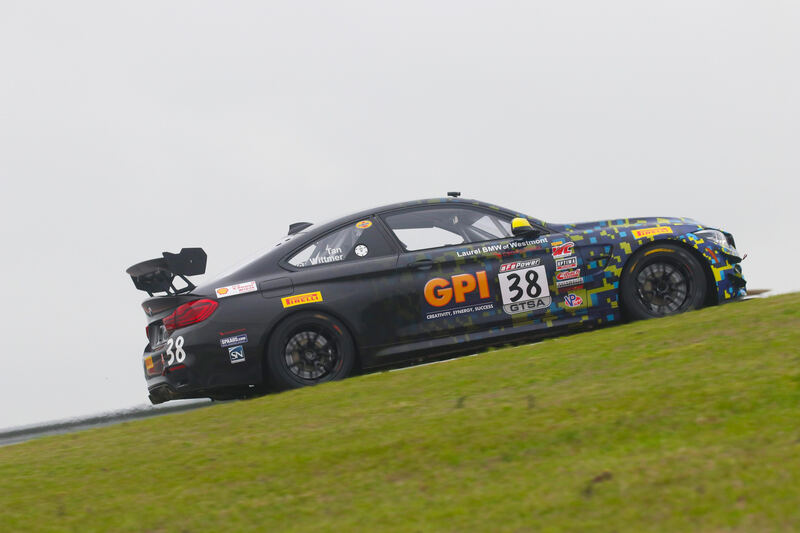 Without a time limit from the ST Racing crew, I run their GT4 out of fuel and have to get towed back into the paddock. 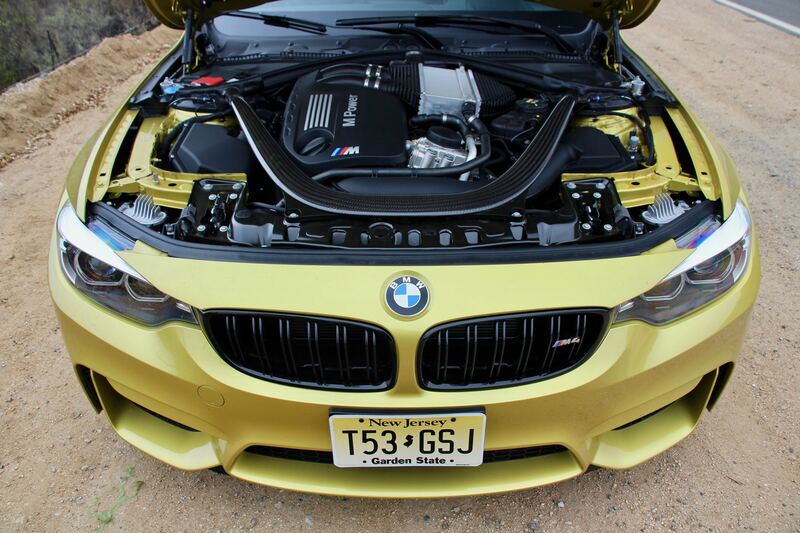 What’s interesting is that the GT4 gave me little warning that it was low on fuel. 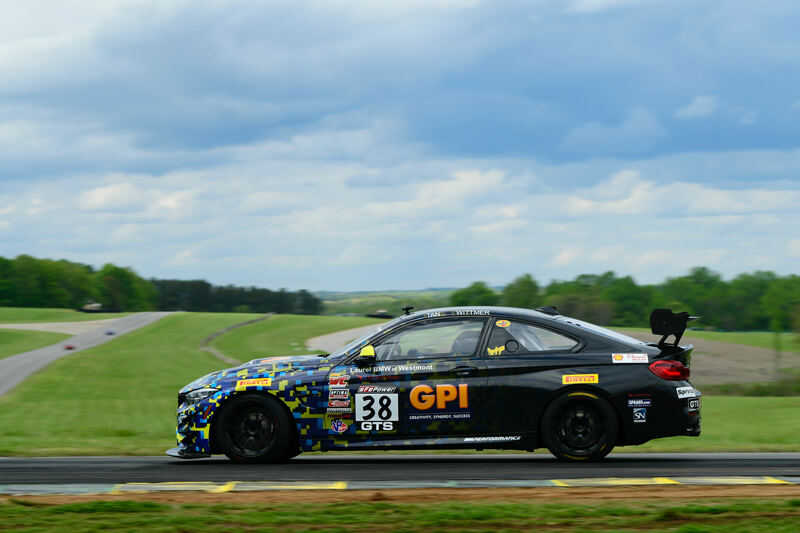 I had a barely noticeable drop of power at the top of the esses and two corners later, or about three hundred yards, it was out of fuel. 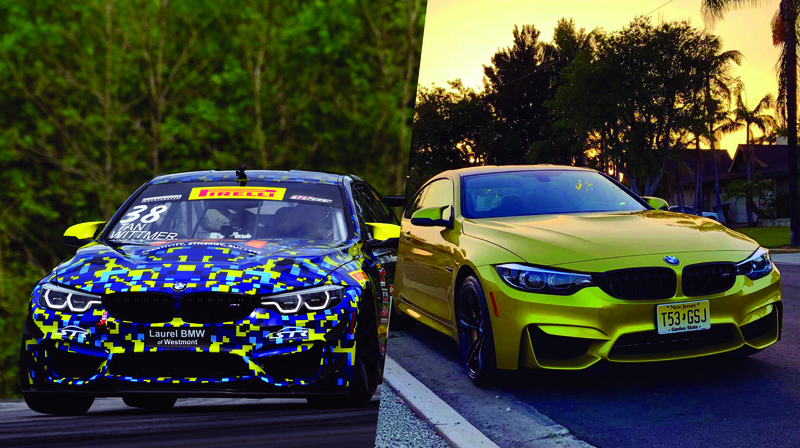 We can call that racecar development, can’t we? 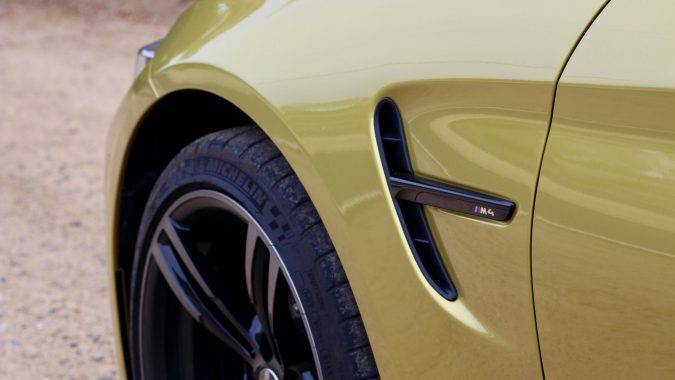 To get your hands on one of these M4 GT4s, it’ll cost you a tick over $260,000, depending on exchange rates with the Euro. 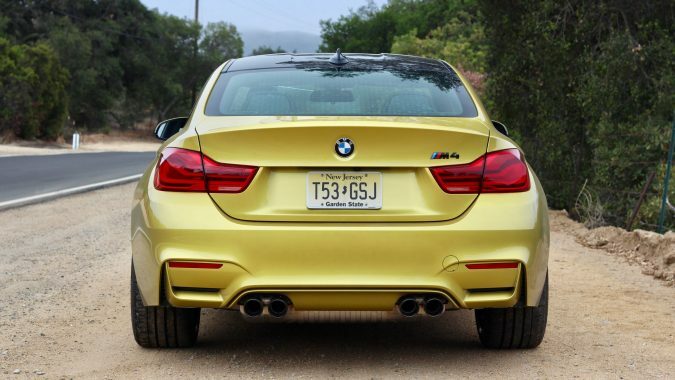 Perhaps the best way to think about it is that the racecar costs roughly three times the cost of the base M4 road car. 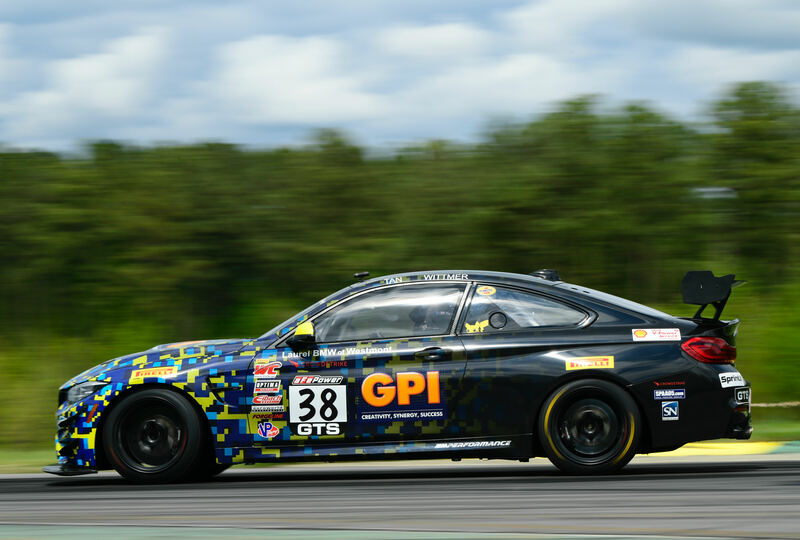 Still, even after the purchase price, the cost to race any GT4 is significant, but that’s another story. 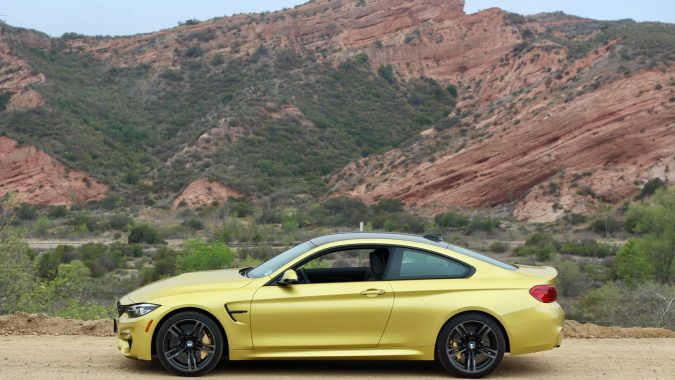 On the other hand, I may be wrong, there’s not much chance you can buy an M4 GT4 because I’ve heard that BMW has already sold their entire production run of around seventy cars. 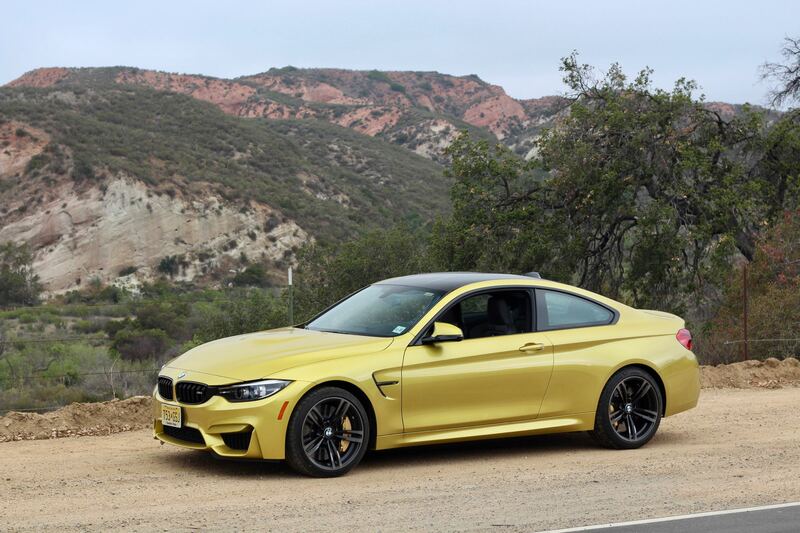 It’s no surprise, either, because this M4 GT4 was designed to do one thing very, very well – to be enjoyable to drive while winning races.